Recently changed my oil and filter and was confronted with the paper oil filter with a plug (with O ring) on the bottom of it. This is a replacement paper type filter and not the metal cartridge type. 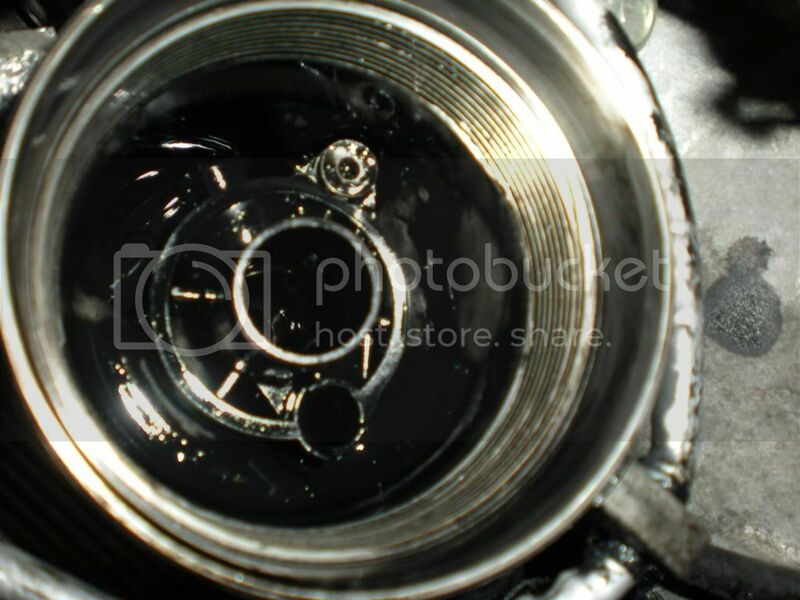 After examining the filter it was obvious that it would only locate in one position inside the filter holder attached to the engine block. The plug located in a small hole in the bottom of the holder, the filter 'cap' then being screwed down onto the assembly. But what is this plug for? I have trawled all manner of sites and manuals but can not find any reference to this or instructions for a filter change of this type. Any ideas? Something to do with the turbo perhaps? On the matter of oil changes one 'site' recommended an oil change every 3000 miles!!! Bit over the top! 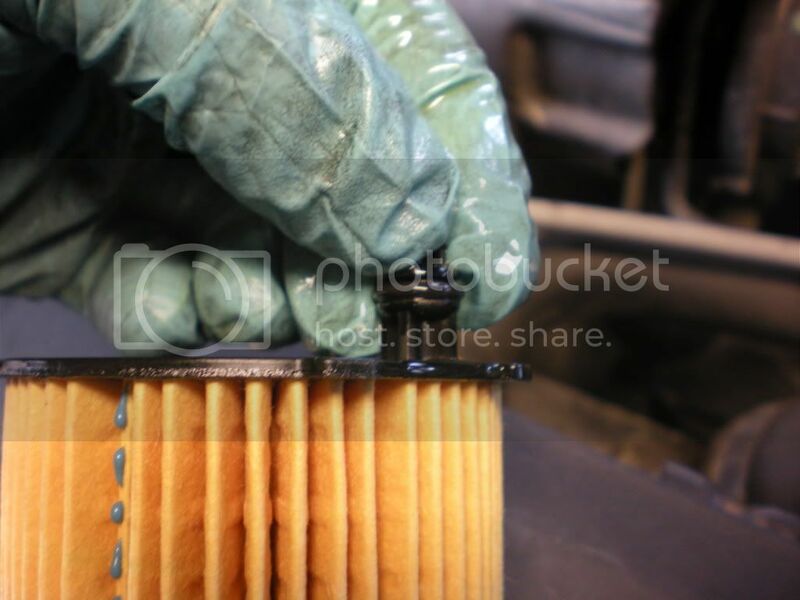 reduces the mess of oil when changing the oil & filter. Btw what oil did you use...? Drain Hole at the 5 o'clock position. Plug/o-ring on oil filter cartridge. Thanks for the reply and very helpful photographs. I now understand. Basically, the bung is a means to prevent spillage when removing the oil filter by allowing it to run away down the drain hole. The oil I use is the one recommended here in Spain which is Total Quartz (Diesel) 7000 Synthetic 10W 40. I know there are issues over oils regarding this engine with low viscosity variants being those most preferred due to 'sludging' up etc. Are they your own photo's or are they from a manual? Are they your own photo's or are they from a manual? Too much sun here at the moment. Got up to 38 degrees the other day and reports of 40 in some places! Whatever happened to 20/50W for everything? I presume I performed the filter change correctly, that is, oil filter in lower engine end part, locating plug in hole, then screw cap on? Can't see how it can be done any other way or you would not be able to locate the lug in the hole! a compatible oil for a bit less dosh. The magic numbers to look for are: PSA PEUGEOT & CITROEN B71 2290.
http://www.nielsencdg.co.uk/acatalog/Tot..._5W30.html ....the delivery charge is also reasonable. Having made reference to a Citroen document regarding engine oils for this motor the comments made are quite correct. Here, in Spain, the recommended oil is the 10/40 (Quartz 7000) due to the higher ambient temperatures (its 2145 here and still 28 degrees). I checked the reference B71 2290 and found that my oil was B71 2294. I may, therefore, need to look for an alternative for my next change. As stated, the B71 2290 is specifically for the Euro 4/5 engines with particulate filters. I was also taught NEVER to immediately turn off a turbo charged engine but allow it to idle for a few seconds prior to turning off the ignition. I think this sound advice has been forgotten during the passage of time! Hi Ol' Jeffers, that's a great find on the price of Total oil :thumbsup:. Cheapest I could find local to me is £28.00 :dislike:. (12-07-2011, 09:57 PM)bingo Wrote: Hi Ol' Jeffers, that's a great find on the price of Total oil :thumbsup:. Cheapest I could find local to me is £28.00 :dislike:. (12-07-2011, 07:53 PM)El Berlingo Wrote: I was also taught NEVER to immediately turn off a turbo charged engine but allow it to idle for a few seconds prior to turning off the ignition. I think this sound advice has been forgotten during the passage of time! This is to allow the turbo to cool down with cool, fresh, pumped oil in its bearings. If you switch off before its cool, the oil in the turbo bearings carbonises and shags the bearings.